A warm welcome from the team here at Hog Roast Machine. We are delighted that you have joined us at that would suggest that you have more than a passing interest in hog roast machines. That’s good, because when it comes to experience and knowledge in the hog roasting business, we are the people that you need to speak to. Over the years, we have built up not only an incredible amount of knowledge with regards to the hog roasting industry having been a major part of it for over 20 years, but we also know an incredible amount about the technical process itself. These years of first hand experience of the industry have taught us what a good roasting machine should be like. That is why we have come up with the stunning range of Platinum machines. Each one of these incredible units represents what we believe is the very best that you can get when looking for a superb quality hog roast machine. 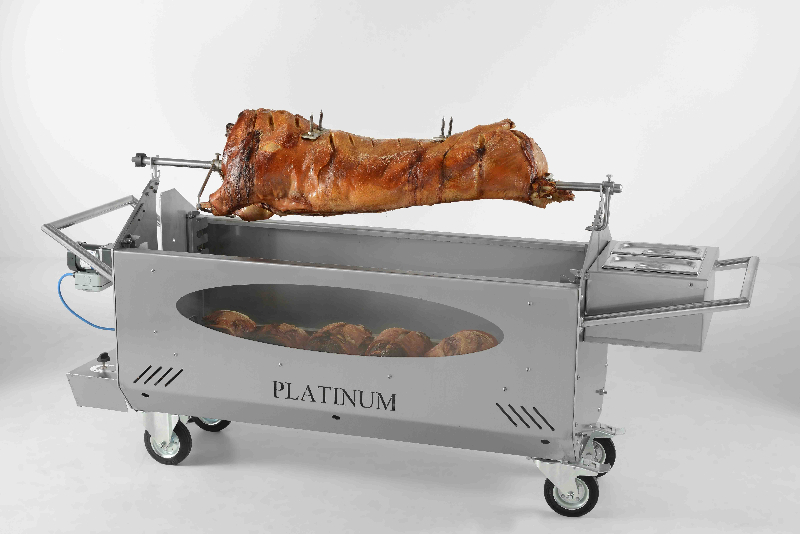 Dual Heat Controls – One of the most important features of the Platinum hog roast machine is its independently controlled burners. Two propane burners run the length of the machine and supply the heat for both cooking levels. This input can be controlled via the gas box which gives the user full control over the temperature of the machine giving an even temperature throughout. 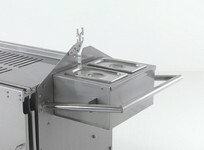 This produces a better finished product and allows the user to slow cook meats or speed up the process if required. The machine also operates a self ignition system for completely safety and ease of use. No other hog roast machine on the market offers this much control over the cooking process that’s why we guarantee perfect results every time. Hog Roast Machines designed and built by a Hog Roast Company! 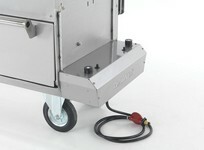 We really have made the best possible use of all our hog roasting and catering experience when designing these machines. Having been out there on the ‘front line’, we know the sorts of the things that would have proved to be really useful for the caterer. We have now had the chance to put this into practice and come up with a hog roast oven machine that really can deliver a totally wonderful pig roasting experience, not just for the caterer but for the diner too. Here at Platinum Hog Roast machines we understand the importance of image. That’s why we have created a product that not only produces fantastic results but also takes into account the look. For example the machine uses glass viewing windows on both cooking levels, so both the user and the customer can look into the machine and watch the pig slowly rotating over the flames or the joints cooking in the lower level. It really adds to the excitement of the event and is sure to get mouths watering. During the service the upper layer spit or hog roast can be raised up into the service position, this not only puts the meat at the perfect height for carving but also puts the meat in pride of place, ready for the customers to marvel at. The meat can then be carved right onto the machine which really adds to the theatre of the event. The Platinum hog roast machine won’t disappoint! 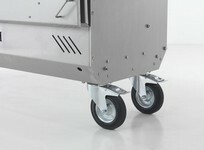 Mounted on four catering caster wheels the Platinum Hog Roast machine is completely mobile. We understand that mobile caterers often have to work in unusual and restricted areas and therefore they need equipment which makes life easy and allows the user to get on with what they do best, cook. 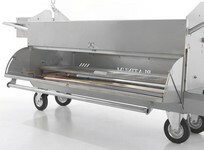 That’s why the Platinum Hog Roast is designed to help the mobile caterer, easily in and out of any commercial vehicle and with two steering wheels the machine can be moved into even the tightest spaces safely. Another feature unique to the Platinum hog roast are the two gastronomes attached to the end of the machine. The excess heat from the machine is utilised to warm the two gastronomes which can be used to both store food products and even cook from. For example when serving a hog roasted pig the stuffing can be added to the gastronomes to be kept warm. Other options included gravy, soup, fillings for jacket potatoes, vegetables and so much more. This option not only helps keep food warm for longer services, but allows the chef serving from the machine to add additional items to the plate improving the level of service and adding to the theatre of the event. There are four choices for the upper level of cooking on the machine, each offers the user something different and brings a unique set of capabilities to the machine they are a follows. So, what makes the Platinum such a fantastic machine and what sets it apart from other pig roasting solutions? Well there is a lot going on with our Platinum not least the increased capacity. There really is a serious amount of room inside this machine. In fact, it has the largest capacity of any other machine available on the market! Of course, a lot of capacity in a machine like this is very important but what about versatility? Don’t worry, the Platinum pig roast machine certainly does not fall short in that respect. Thanks to the dual cooking options, the machine has two cooking levels, allowing you to spit roast a pig on the upper level and cook other items below. This is incredibly useful as it means you could use the lower level for cooking some potatoes, vegetables or maybe an additional joint of meat for those who are not keen on hog roast. This really does make the Platinum something of a wonderfully versatile machine and will no doubt prove to be a big hit with many caterers up and down the country. But there’s more. Dual heat controls allow you to vary the cooking levels, something that could come in really useful for roasting perfection. Another unique Platinum feature. Features aren’t everything of course, and the Platinum is a bit of a looker! The beautiful finish and the viewing panels make this a really tasty looking machine. There are even gastronomes which help keep gravy, stuffing and soup, warm! And we have not even mentioned how durable and mobile this machine is yet. Suffice to say, the Platinum is the business!